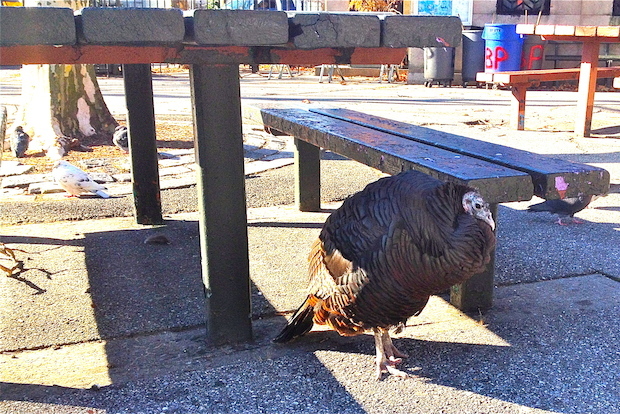 FINANCIAL DISTRICT — Turkeys, take a tip from Zelda: hiding under a picnic table may just keep you off the dinner table. Battery Park’s beloved resident turkey has made it through another Thanksgiving, this year shying away from the crowds of tourists who braved the cold to wander Lower Manhattan. The ageing bird, a fixture in Battery Park since she mysteriously wandered into the gardens in 2003, spent much of Thursday secluded under a picnic bench — a “favorite hiding spot” — said Parks Department workers. Most turkeys don't live past 6 years old, said Warrie Price, president of the Battery Conservancy and while she does not know Zelda's exact age, it's safe to assume that the bird's getting near the end of her life. “She’s like our mascot, and we’re just grateful to have Zelda with us for another Thanksgiving,” said Price. The conservancy named Zelda after the wife of novelist F. Scott Fitzgerald, because she, too, was found wandering the park, supposedly after a nervous breakdown. Unlike that Zelda, though, Battery Park's turkey has never had any children — though she is known to head elsewhere in the city to lay unfertilized eggs and nest for about six weeks each summer. But on Thursday, Zelda's brief journey was a quick trip from the picnic table, to another hideout — a jungle gym in a Battery Park playground that remains shuttered, and gated off, since Hurricane Sandy. And while she was mostly obscured from view, one family passing by noticed the curious site of a large turkey crouching in the playgroud. "Wow, that's a turkey," said Wasif Khan, a 19-year-old from Queens who was showing family visting from London around the city Thursday. "That's unexpected — how is that turkey not on somebody's table?"